I know when I read that title I was expecting so fire and brimstone preachiness. Boy was I ever surprised! Not at all what I was expecting, Heaven and the Afterlife was a very informative book that really helped me with many of the questions I've had for years. I think most of us have question about the afterlife and this book does a good job of answering some of those questions. Better still is that this is not just full of wild opinions, all the views expressed are really well researched. Seeing the footnotes in the book really reassured me of this fact. It is written in a style that is very easy to understand. I've read books addressing heaven and hell that were quite hard to follow, so this was another pleasant surprise. The author is very straightforward, which really helps when dealing with the "heavy" subject matter. I really suggest picking up a copy of this book. Although it didn't change my believes exactly, it sure had me thinking all the way through. The author gives you a lot of useful information, it is up to the reader to do with it as you chose. 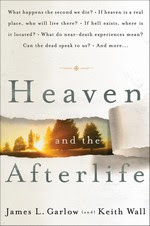 Since we all have questions about the afterlife, this book is an interesting read.